Mission Police Chief Robert Dominguez speaks to graduates and their parents during a graduation ceremony for juveniles who completed the Mission Police Department’s First-Offender Program Thursday, Feb. 15, 2018, in Mission. MISSION — A fresh start was granted Thursday evening to a graduating class of three inside the Community Room of the Mission City Hall. 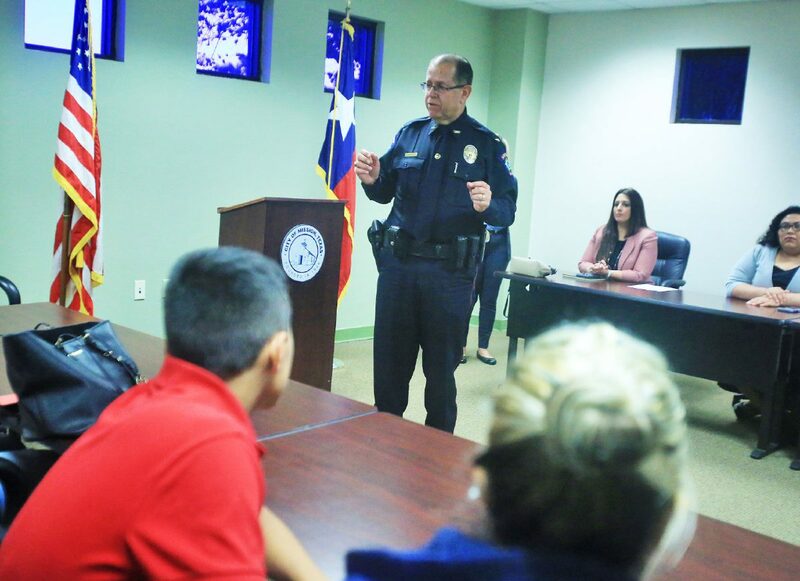 The ceremony marked a milestone for the Mission Police Department, which implemented a program last August to pardon the non-violent first offenses of youth aged 10 to 16 after completion of a six-week course. Members of the juvenile justice panel, Mission Police Chief Robert Dominguez, Mission Fire Chief Gilbert Sanchez and other city officials were present to witness the First-Offender Program graduates receiving their certificates and to offer words of encouragement. 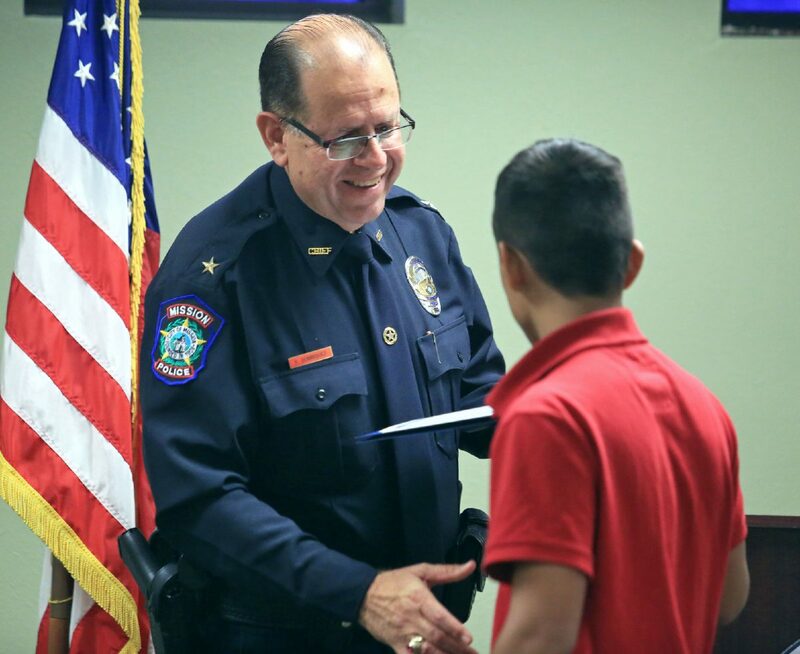 Mission Police Chief Robert Dominguez shakes the hand of a graduate during a ceremony for juveniles who completed the Mission Police Department’s First-Offender Program Thursday, Feb. 15, 2018, in Mission. A graduate shreds her police file as part of a graduation ceremony for juveniles who completed the Mission Police Department’s First-Offender Program on Thursday, Feb. 15, 2018, in Mission. Mission Police Chief Robert Dominguez talks with graduates and their parents during a graduation ceremony for juveniles who completed the Mission Police Department’s First-Offender Program on Thursday, Feb. 15, 2018, in Mission. The graduates sat to left of the podium with a parent or guardian during the ceremony. 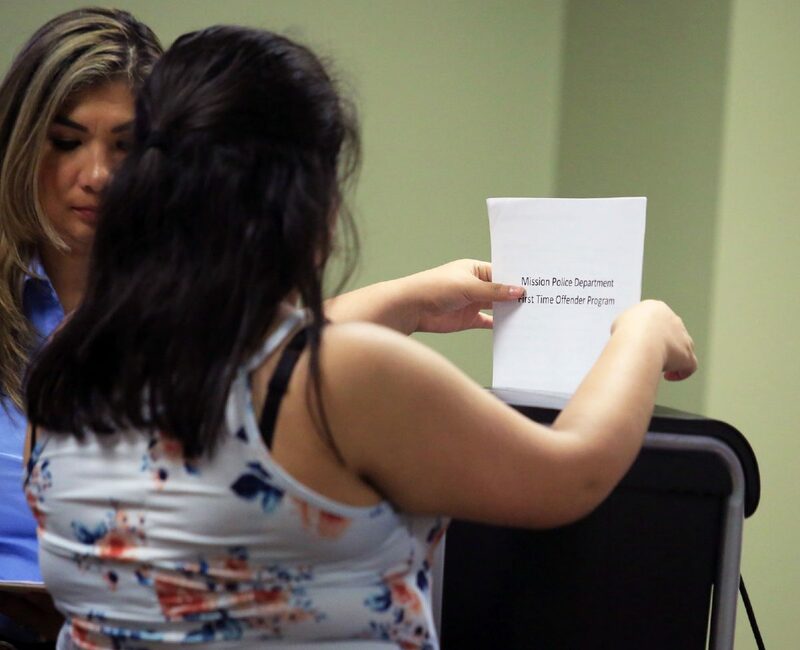 One by one, the program graduates were called up and handed their hard-copy police record containing their fingerprints and history of detainment. Page after page was inserted into a paper shredder, followed by the manila folder itself. Officer Nora Lozano led the two-hour weekly courses, which were attended by not just the youth, but also by a parent. A pre-test is conducted in order to assess the habits, privileges, and “type of attention the child needs,” she said. Follow-ups are done through home visits and periodic phone calls and the youth is to remain in a 90-day probation period. Parental responsibility, Lozano said, is a must. As part of the curriculum the parent has to draw up and sign a contract with their child, regulating their home environment and outlining expectations. State District Judge Renee Rodriguez-Betancourt, who also addressed the group, stressed this point. 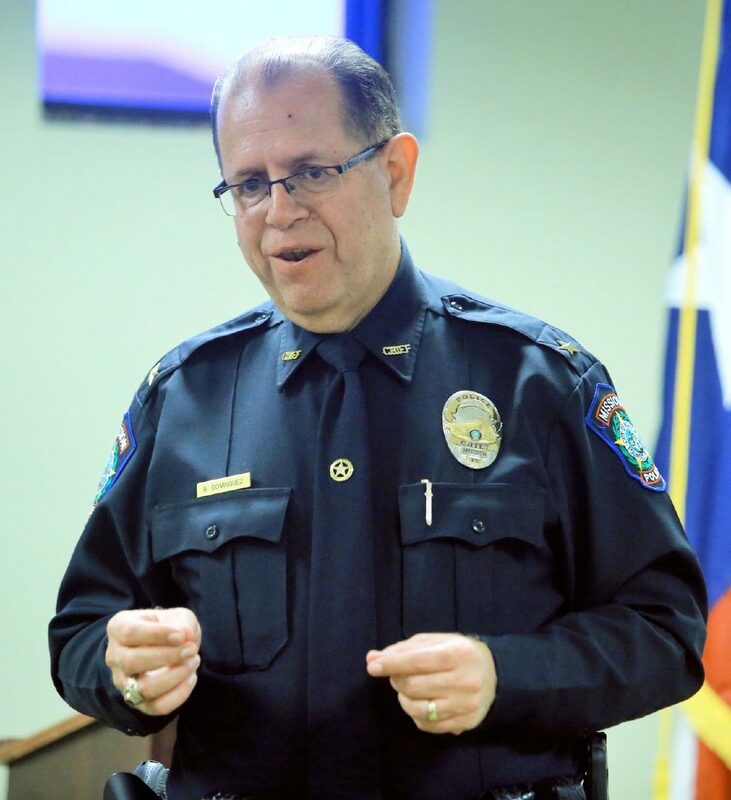 According to Dominguez, upon arrest and placement into the juvenile facility, officers from the police department are involved in assessing which individuals may qualify for the program. The first class was held on Nov. 12, 2017. Out of the other 10 Mission students that have been approved for and begun the First-Offender Program, nine are on track for graduation. “Things will be changing soon,” Dominguez said. “There’s a caring heart in all of us.